Life's a Beach | Expat Life in Playa del Carmen : 2nd Annual Family Eco-Challenge at Ak Lu'um! There are only a few days left before the 2nd annual Eco Reto 2011, a unique eco challenge where families are invited to build the greenest and most original toy or game. Ak Lu'um International School is preparing its jungle campus to receive environmentalists, government representatives and families from the Riviera Maya who will present their original creations to a select panel of judges. 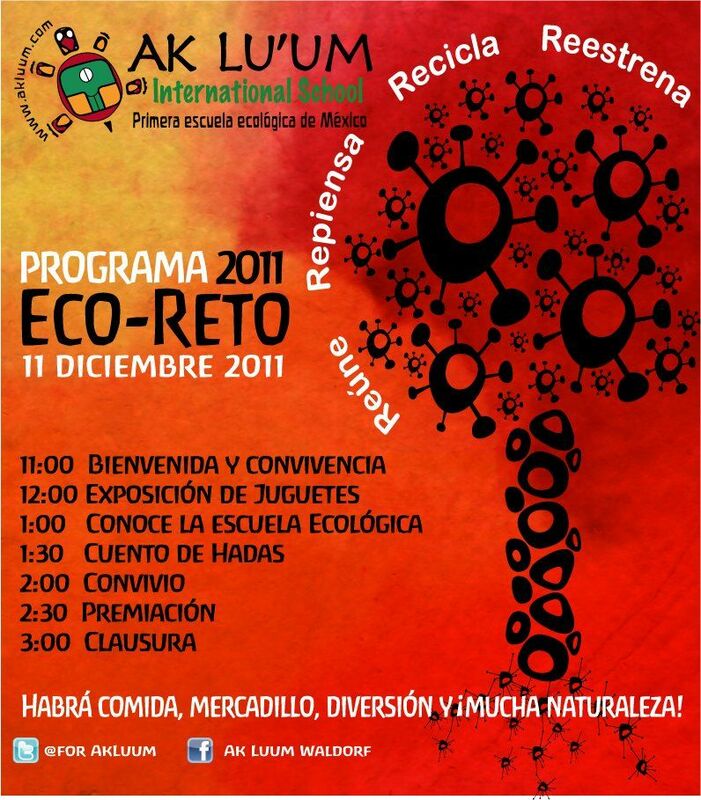 The contest and Eco-Fair will be held on December 11 from 11:00 am to 2:30 pm at the Ak Lu'um International School in Playa del Carmen. Families are invited to design and build a unique toy or game that encourages play without doing harm to the environment. Submissions must be constructed using organic materials, materials that come from sustainable sources and/or recycled objects. Toys and Games submitted will be judged in the following categories: Most original, most beautiful, longest lasting/most durable, greenest/eco-friendly. Confirmed to attend the event are environmental leaders from the municipio of Solidaridad, representatives from SEP, SEMARNAT and UNESCO and representatives from Flora y Fauna y Cultura de México A.C. Local businesses has generously supported the event by donating prizes for the four different categories. Prizes to be awarded will include passes for Xcaret, a boat trip donated by Lucky too, a swim with dolphins from Delphinarium and an electric scooter courtesy of Carpe Diem Communications among other prizes.The grand prize for the family who meets the four categories is a year's free tuition at Ak Lu'um International School worth over $43,000 pesos and is transferable. BuyPlaya Real Estate Advisors, a locally owned and operated Playa del Carmen real estate brokerage, is sponsoring this exciting eco-event for the second year in row. "In a time when technology seems to be taking over our lives by leaps and bounds, we need to be mindful that our children learn to connect "play" with the nature that surrounds them and develop a very real appreciation for its resources." stated Michele Kinnon, owner of BuyPlaya and Ak Lu'um parent. "Having children and parents to work together on a fun project like the Eco-Challenge encourages all of us to take a second look at the amazing bounty of natural resources around us and reinforces the need to protect it for future generations. We are thrilled to support this event and look forward to seeing increased participation year after year." Ak Lu'um International School is a Waldorf Initiative founded in 2006 in the jungle close to Playa del Carmen. The main aims are to promote sustainability, develop ecological awareness and teach children from 2 to 12 to reconnect with our earth. Students at Ak Lu'um learn with their minds, hearts and hands, the curriculum is academically challenging and meaningful with many opportunities for hands-on learning and artistic development. Ak Lu'um also welcomes children with special needs and seeks to integrate them fully, giving all children an opportunity to better know, understand and love fellow human beings. The community at Ak Lu'um International school is bilingual (English-Spanish) and culturally rich with over 12 nationalities represented by staff and pupils.